The speed at which dolphins and orcas can fly through the sea seems incredible for animals of their size. We tend to think of orcas as whales, but these creatures are actually a member of the dolphin family, which contains a large variety of different species. Perhaps the most familiar to most people is the bottlenose dolphin, whom we know well from trips to the beach, amusement parks and TV shows such as "Flipper," and who can clock in at up to 14 feet long and 1,100 pounds. The orca, the largest species of the dolphin family, can extend to 32 feet long and up to 6 tons in weight. When not at risk or hunting, dolphins travel at a leisurely speed of 10 kilometers per hour (kmh), which they can easily maintain for long distances. Orcas are slightly slower, traveling at only 6 or 7 kmh. Both dolphins and orcas really impress when swimming at full throttle: bottlenose dolphins have been recorded at 54 kmh, with orcas coming in slightly behind at 50 kmh. Both species have trouble maintaining such speeds over long distances, and will swim this quickly only when in hot pursuit of prey or fleeing from danger. 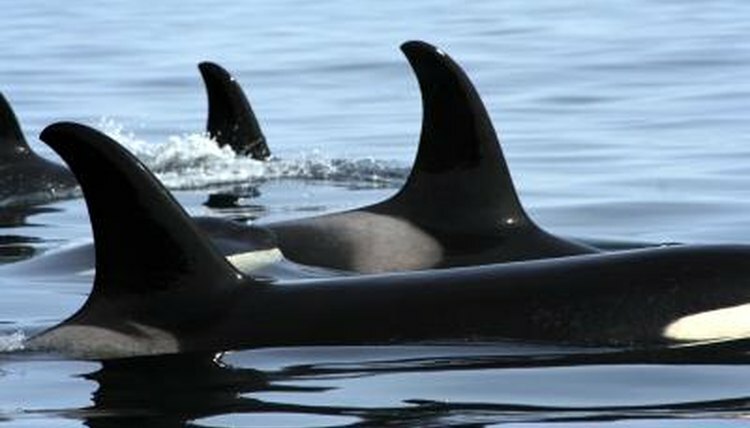 Orcas are natural predators of dolphins, so the dolphin's slight lead can be a significant advantage in moments of escape. While many theories abound about the dolphin's ability to reach such breakneck speeds, Jim Rohr of the U.S. Navy's Space and Naval Warfare Systems Center says that much of the reason is that dolphins' bodies are "incredibly streamlined." Blubber helps the animals stay in control by providing counterbalance to tail movements, and the tail itself is curved rather than flat, which helps the dolphin maintain momentum. Orcas' bodies have a fusiform shape—this means the animal is wide in the middle but tapered at each end, which helps the orca cut through the water despite his large size. Under an orca's hairless skin is a layer of blubber, which contributes to the whale's smooth shape. Orcas also use a swimming technique known as "porpoising," in which they swim just below the water's surface, then quickly rise up above it and back down in one quick move. This technique helps the orcas preserve energy, since porpoising requires less effort than maintaining speed at one depth just below the surface. Another trick orcas use is to hitch a ride on waves or the wake created by boats, which helps them achieve twice their normal speed without exerting any extra energy. How Do the Bottlenose Dolphin's Adaptations Help It Survive?